Hooray! It’s time for our weekly round up of all those lovely dresses that receive the highly coveted She and Hem Double Thumbs Up seal of approval. First up we have these two beauties from Lady V London! We are big fans of Lady V London here at She and Hem. In fact, if you are so inclined, you can currently give Victoria a literal thumb up over in their Facebook Hall of Fame competition. Speaking of Victoria, whilst she has been in Croatia – for what feels like actually forever – the only dresses she has been so hyped about, she had to send me have been the two above. I’m too ashamed to show you the actual transcription that took place but sufficed to say it went a little like this ‘OMG BALLOON DRESS’ ‘OMG I NEED IT’ ‘OMG ME TOO’ ‘OMG FRUITS!!!’. We both have degrees you know. Anyway, they will look simply marvellous with a great swooshing petticoat underneath and would make fabulous wedding outfits to boot. Both of the dresses above are Lady V’s tea dress collection which I find to be a very flattering shape. However, if you aren’t a fan of a high neck then you can also try their super pretty swing dresses. Topshop have done it again with their lovely sleeved dresses. It’s so purdy. I love the scalloped hem and the dainty cut out detail. I want to wear a big hat and stroll barefoot along the beach in this one. I am a not so secret lover of Marks and Spencers’ Limited Collection. I have been known to walk around stroking the clothes and muttering “lovely, just lovely” for hours on end. I also find a lot of their stuff to be perfect for work without being boring. This makes me happier than one might say is normal. 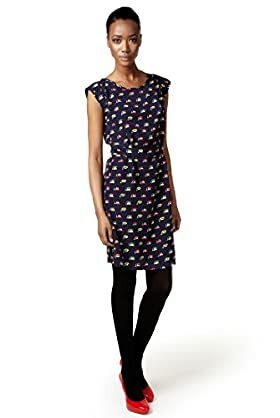 One of my favourite and most complimented Limited Collection pieces (yes, I did just say piece) is an owl print dress (this owl print dress to be precise). 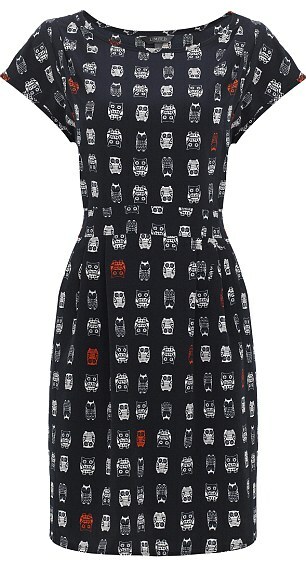 Well recently M&S brought out another near identical dress which had simply swapped the owls for telephones (this telephone dress to be precise), I was intrigued. Could I really buy my beloved dress again? Eventually I decided that no, no, I couldn’t do this. People would talk. So what on earth do I do now that they have brought out the same identical dress again but covered in teacups? This one is even more identical than the telephones! You are making a crockery of me M&S! I actually can’t not have this dress! It’s covered in tea cups for goodness sake! But please, PLEASE, just change the colours next time? Ta. Remember last week when I promised that this week would have more bank balance friendly dresses? Well I lied. Soz. I’m afraid we are just going to have to sit and pine together as there are just a lot of expensive pretty things around at the moment. This Oasis dress reminds me of a Habitat bedspread I once owned and if that’s not a reason to love it I don’t know what is. The colours are saccharine sweet and the cut outs are unusual in a good way, dontchathink? You can get 20% off dresses at the moment using the code 20MayDress so you could save yourself some £££ if you so choose. Oh I do love this 60’s inspired dress from Tesco’s Florence & Fred. I love the colour (although if you aren’t so keen it also comes in pink) and the giant daisies. It also has my beloved peter pan collar! You could just throw it on with some sandals in the day and then really go for it in the evening with fun tights and 60’s style accessories. This entry was posted in Clothing, Double Thumbs Dresses and tagged Dresses, Florence & Fred, Lady V London, M&S, Oasis, Tea Dress, Topshop by She and Hem. Bookmark the permalink.